"We were visited by Ashley Blaydes from One Stop Shop in the Berry Hill quarry this Wednesday. She came along to see the Lending Library in action. We have sent this photograph and a press lease off to the local press so look out for coverage in the Chad or NewsJournal. Hopefully the One Stop Shop store might be able to help us with further funding or books in the future. We do hope so. 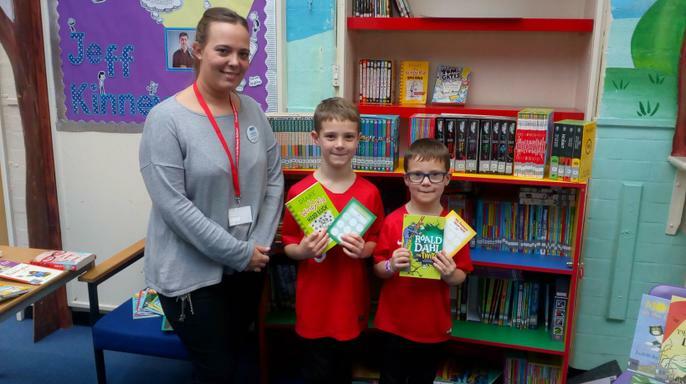 Don't forget to come along to the Lending Library each Wednesday after school to swap your books to make sure reading is an important part of your routine at home."